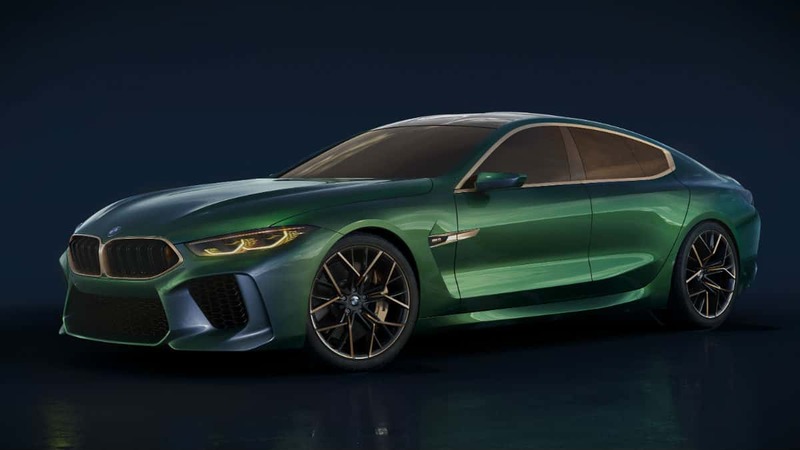 Like the BMW Concept 8 Series before it, the BMW Concept M8 Gran Coupe shows off BMW’s new design language, headlined by expressive surfacing that accentuates the car’s dynamism more vividly than before through its bodywork. A small number of precise character lines underline the graphic arrangement of the surfaces. The front end: a promise of dynamic talent to quicken the pulse. 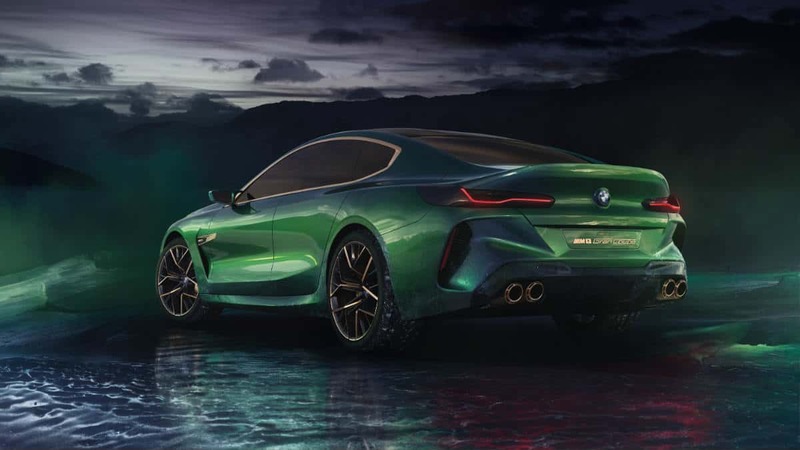 Low to the road and broad in stance, the eye-catching front end of the BMW Concept M8 Gran Coupe delivers an immediate promise of an exceptional performance experience. The muscular surfaces and precise contours of the bonnet hint at the driving capability bubbling intently under the skin. The face of the new BMW 8 Series is evident in the new Concept’s front-end graphic. The contours of the radiator grille kidneys broaden as they descend towards the road, emphasizing the car’s low center of gravity. As on early BMW coupes, the kidney elements are linked by an unbroken grille surround, creating a large single element. The headlights are positioned slightly higher than the kidneys and give them the impression of sitting lower, which further emphasizes the car’s closeness to the asphalt. In contrast, the gold-colored kidney surround brings an added air of exclusivity to the front end. Within the headlights, the lighting technology familiar from the M8 GTE endurance racer provides a dynamic, hexagonal interpretation of BMW’s signature four-eyed front end, distilling elements of modern-day motorsport and luxurious quality into its inner details. Meanwhile, brawny air intakes in carbon-fiber reinforced plastic (CFRP) guide the air to where it is required. 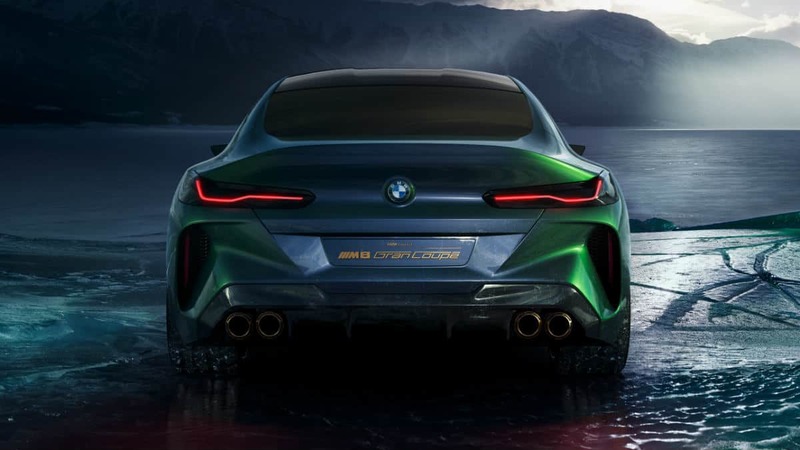 Even when viewed from a distance, the proportions of the BMW Concept M8 Gran Coupe radiate the car’s dynamic character. A long wheelbase, long bonnet, flowing roofline and short tail create an elegantly sporty coupe silhouette. The emotionally rich surfacing reaches a climax in the car’s shoulders around the Cpillars, north of the rear wheels. Here, the roof flows into the rear by means of elegantly sculpted fins. Lower down, the muscular flared wheel arches offer a visual expression of the power working through the rear axle. The smooth transitions between surfaces exude a certain sensuousness, while the heavy tapering of the car’s shoulders combines with a wide track to bring extra definition and athleticism. 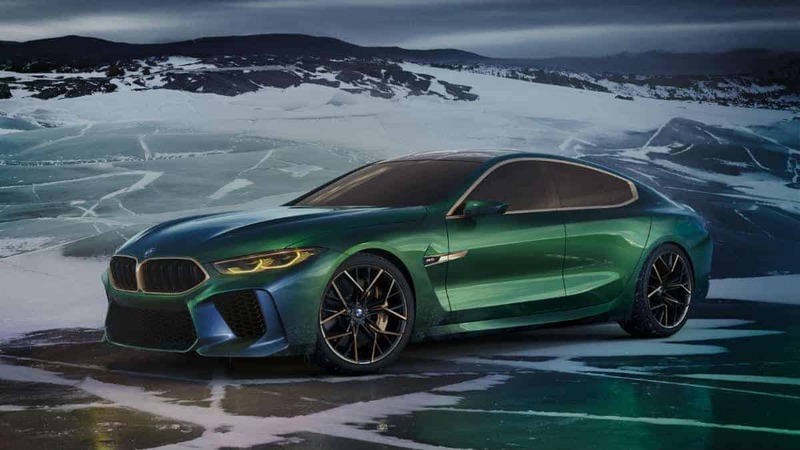 Being every inch the BMW M car, the BMW Concept M8 Gran Coupe has a roof made from CFRP – which lowers the car’s centre of gravity both visually and physically – and aerodynamically optimised exterior mirrors. The Salève Vert paint finish, whose color appears to change from green to greyish blue in different lights, creates a hugely effective surface composition and teams up with the gold-colored window graphic, hallmark M gills, gold-coloured brakes, wheel rims and M twin exhaust tailpipes to give the car a head-turning, all-new look. 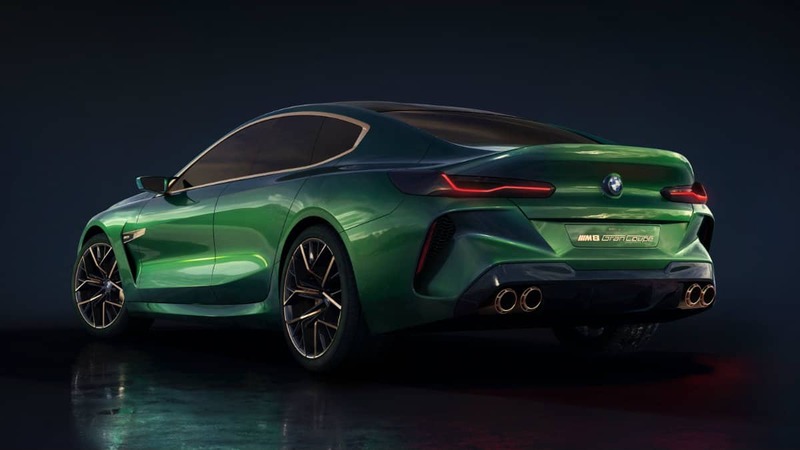 The rear of the BMW Concept M8 Gran Coupe oozes the dynamic élan and visual impact for which M is renowned, and the wide track and flared wheel arches hint at the car’s performance capability. 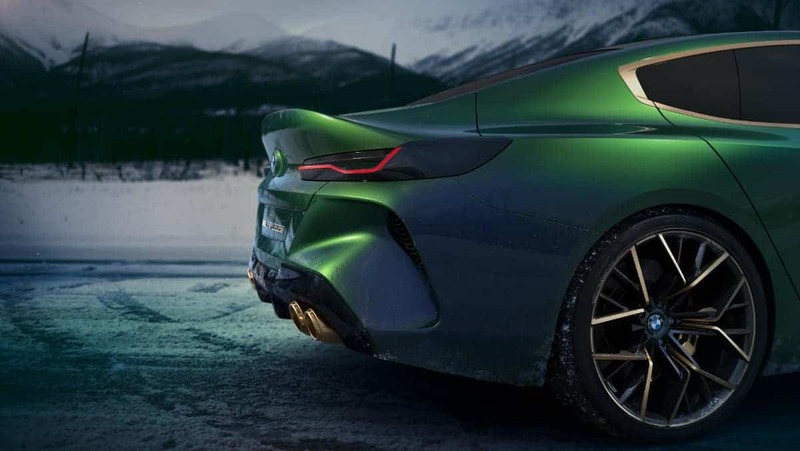 Horizontal lines break up the rear end stylistically, allowing the area below the rear spoiler to catch more light and adding extra visual agility. At the outer edges, the slim, sculpted rear lights with black glass covers underscore the car’s wide stance on the road. Below them, the bumper picks up the front apron’s dynamic theme. The prominent diffuser and two sets of familiar M twin exhaust tailpipes together send out a clear message of absolute performance. 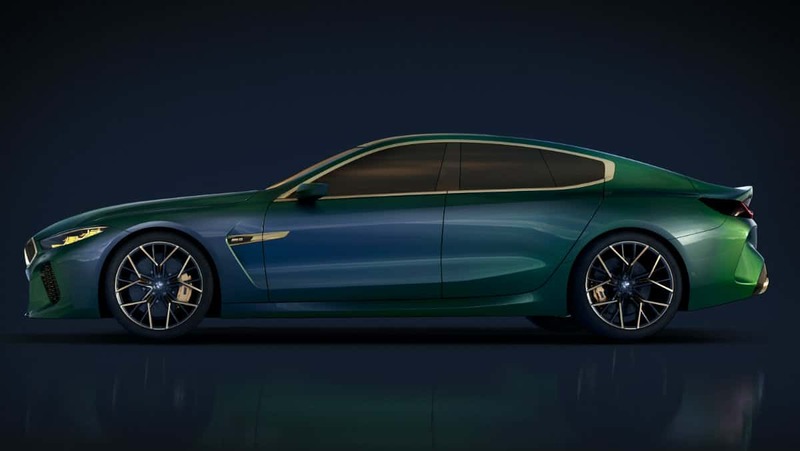 The striking exterior of the BMW Concept M8 Gran Coupe combines the core values of BMW M with elegance and luxury to create a new and captivating form, and reveals a new and exciting facet of BMW M. The new model sees the BMW Group looking ahead to the BMW 8 Series Gran Coupe and BMW M8 Gran Coupe.